hunts in the City looks at the top ten reasons and attractions for making Chichester one of your `must visit`places in Sussex. From a guarantee of never getting lost to following in the footsteps of the Romans, a personalised treasure hunt in Chichester will provide you with a host of great memories. Chichester is easy to navigate. 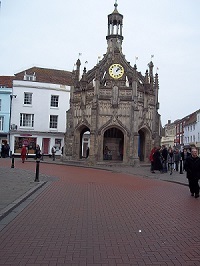 The Market Cross is bang in the middle of the City. From there you can either go East on East St, South on South St. West on West St or North St. I mean.. come on..that has to be a great start to finding your way around. Remember in Brighton that North St runs East/West and West St goes North/South! The Market Cross is considered the ideal place to meet up at and has handy clocks so that you know how much longer you have to wait or indeed how long is left on the treasure hunt! If you are visiting from abroad I think you will agree that it looks impressive too and if you are from France you will be pleased to know that it is made from Caen stone. Locals may have expected me to talk about the cathedral next, having begun with the market cross, as it is literally just a stone`s throw away. However, I have walked around Chichester many times in a search for the perfect treasure hunt route and keep coming back to the Festival Theatre as the ideal place to start. It has a huge open,uncovered and flat car park which makes it perfect for teams of treasure hunters, on an office awayday treasure hunt maybe, to rendezvous easily. Not only that, but the location of the theatres (there is the smaller Minerva Theatre there too), adjacent to the large expanse of greenery at Oaklands Park, make it an invigorating and uplifting place from which to start an exploration of a new place. The festival theatre (Chichester Festival Theatre) has an international reputation and for those of you considering a visit is a `theatre in the round`...in other words the stage is set in the middle of the audience. Another important reason for setting off from here is that there are a number of good early clue options for a treasure hunt. There is a sculpture not only of Oedipus, but of Spartacus too. Outside the Minerva Theartre there is, predictably, a sculpture of the Goddess herself. She was the Roman Goddess of poetry and magic amongst other things! Not a bad combination. A better class of busker. A personalised Black Cat treasure hunt will incorporate a series of challenges involving the taking of a photo or video clip of your team achieving a specific challenge. If you have indicated music or singing or dance maybe as an interest it may well help if you come across a busker on route to provide accompaniment to your team`s efforts. A good busker may even lead to getting more points on that particular challenge. Maybe it`s because they are looking to get a break at the festival theatre, a bit like everyone who lives in Hollywood is a potential film actor, but I have noticed that a high proportion of the buskers in Chichester seem to be very talented. Clearer voices, better equipment..bigger tips! Better buskers mean better treasure hunts! It may be more accurate to say you won`t be able to forget the Romans whist you are in Chichester because there is still their influence to this day. It`s an influence I like and one that makes Chichester unique and worth visiting for this reason alone. Best of all you can walk around large sections of the City on just the old Roman walls. This is fun and gives a different perspective entirely when you are on the look out for clues. 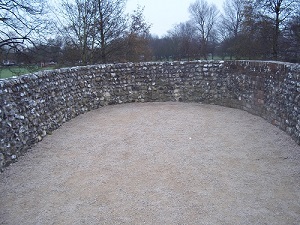 This is a Roman bastion from which you could fire a crossbow or ballista. It is sited in a garden near the cathedral and useful noticeboards abound to give you the answers to any tricky sounding qustions. Noviomagus was the old Roman name for Chichester and the brilliantly named Tiberius Cogidubnus was a King of Britain, having been granted Roman citizenship. Once you have dusted down your toga and said "Hail Caesar" ,the next Black Cat visit- worthy reason for coming to Chichester is Priory Park. Apart from the aforementioned Roman walls all the way round this particular park,there are a number of other reasons that force this corner of Chichester into the top ten. It has a slightly hidden entrance which I quite like as it gives it a sense of mystery. There is a sensory garden, the Guildhall and a fine cricket ground which combine to give it variety and interest along the way. Add to this a large cage of parrots which appear a little unexpectedly and you will start to understand why I have made this choice. 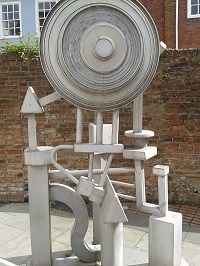 Treasure hunts rely on maintaining the interest of the participants and this park does a great job in doing just that by linking North Street almost all the way to the bottom of East St.
A treasure hunt compiler`s job is to unearth the unusual and fun clues on a chosen route. Chichester will happily oblige on that score by giving you the chance , if you are alert, to draw attention to an interesting and eclectic mix of questions. One moment you discover gunpowder is stored under one of the Roman walls, the next you gaze up and find out that Keats wrote one of his poems here. I am not going to advise you on which restaurants and pubs to visit when you are here because that is down to individual taste and budget, but The Hole in the Wall pub has a conveniently placed plaque that gives an answer as to why it is so named. You can have a proper restaurant meal here and even dine outside to admire the unusual sculptures on show. Museums and galleries may not be your thing, but you will be surprised how Black Cat can create a question or challenge connected to an anecdote or interest you have supplied for a personalised hunt and link it in with an answer to be found in this type of venue. Besides , even if you do not venture inside the Pallant House Gallery you must, I repeat must,walk past the entrance and admire the hilarious Dodo`s on display or possibly they are supposed to be Ostriches!? I better not leave this too long as you may think I`d forgotten about it. 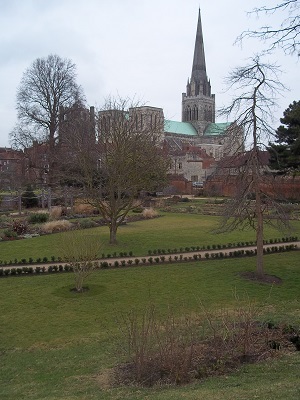 Chichester is the possessor of the only cathedral spire in England that can be seen from the sea...a great connection to a possible treasure hunt clue if ever I heard one. Whilst on that subject there is a statue of William Huskisson MP inside the cathedral. He was the first ever casualty of a train, being run over by Stephenson`s `Rocket` on its inugural trip no less. There is a massive bell tower next to the cathedral and also another statue, this time of Saint Richard, patron saint of Sussex, nearby. I tend to finish my Chichester treasure hunts in North St for a number of reasons. It is pedestrianised..it has several cafes you can sit outside and pass the time of day people watching/relaxing, and it also has several decent pubs to toast the winners of a teambuilding treasure hunt, if that is the style of hunt you have chosen. Just a quick return to the Roman connection and there is a stone memorial inscription to King Cogidubnus himself in North St! There is always a pleasantly busy vibe in North St. Chichester is one of only two University Cities in Sussex and, as such, students tend to come down into the City Centre via this street,whilst tourists will also use it to access some of the places I have already mentioned. Not only do they bring colour and interest to the City, but they are great for unexpected treasure hunt questions or challenges or maybe as a one off general knowledge question for a tie breaker! https://www.blackcattreasurehunts.co.uk/hunt-253 ....On-line treasure hunt link.